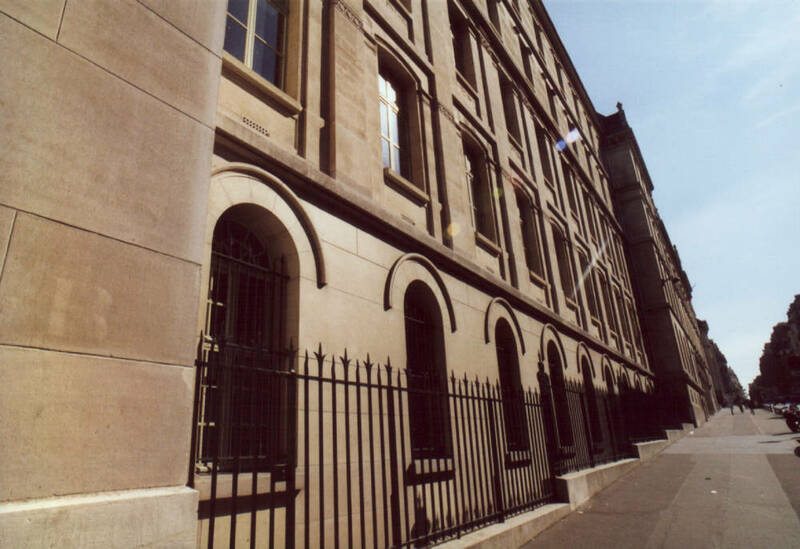 Virtual tour of Louis-le-Grand high school (1996-1998) | PyVotons ! At the beginning, this was about visiting the highschool from picture to picture in a Visual Basic 6 software. Pictures were taken with analog manual SLR cameras, digitized using a flatbed scanner and converted to GCD by myself on a Pentium 133 MHz computer. I then used a small program to define click zones for each image. A few pictures were taken using a low-res digital camera lended by a friend (Habib Shoukry), a Sony that stored the pictures directly on a floppy disk. We were given access to the scientific museum and the old library, but I did not find those pictures yet. This project dating from 17 years, I lost some data in the mean time. I don’t have the digitized JPEG files (deleted probably because the hard drive was full, and maybe on some old CD-R somewhere), the original film is probably in a cellar and I still miss a number of pictures in the version I recovered. If I find better data on old CD-R or ZIP disks, I will update the online version. En 1997, Visual Basic could not display JPEG images, only BMP. But those files needed so much space that it was not possible to store all files in BMP and having the whole project on one CD. Laurent Demonet offered to design a file format and C library using similar principles as GIF, with an OCX element to be inserted in Visual Basic UI. Image quality seemed ok at the time (reduced color palette and resolution sufficient at the time). Fortunately I found the source code of the OCX control, so I wrote a C++ program to convert the old GCD files back to JPEG (thanks to Qt library). The labels of images were saved in simple text files, but character encoding was windows 95 french encoding – CP1252. I thus converted these to UTF8 using iconv. I did not recreate the original UI, but just wrote a simple HTML5 page using AJAX to get images and click zone data. I still haven’t put the small highschool map with active points to start on different places… yet !